The owner of Wimpy’s Diner on Kingston Road has a message for his customers: We’re still here. Almost all of the storefronts that share the Birch Cliff strip with Wimpy’s are closed or will be closing soon, after the property was sold at the beginning of this year. Core Development Group wants to redevelop the site at 1480 to 1496 Kingston Rd. and turn it into a eight- or nine-storey mix of residential and retail development. But while most of the tenants had until July 2017 to vacate, with many leaving months before that date, Wimpy’s, the colourful neighbourhood restaurant that occupies the eastern corner of the property, received an extension on its lease and will continue to operate until July 2018. Roy’s Salvage Shop is also still open. The problem, says Wimpy’s owner Aminul Chowdhury, is that with all of the surrounding businesses closed, and the attention that has garnered, people think he is closed, too. Business began to slow down “randomly” in the spring, he said, right after the media began reporting on the changes to the property. But a few months ago, his staff began getting phone calls from people surprised to hear they were still open. “People thought we were closed too,” said Chowdhury. 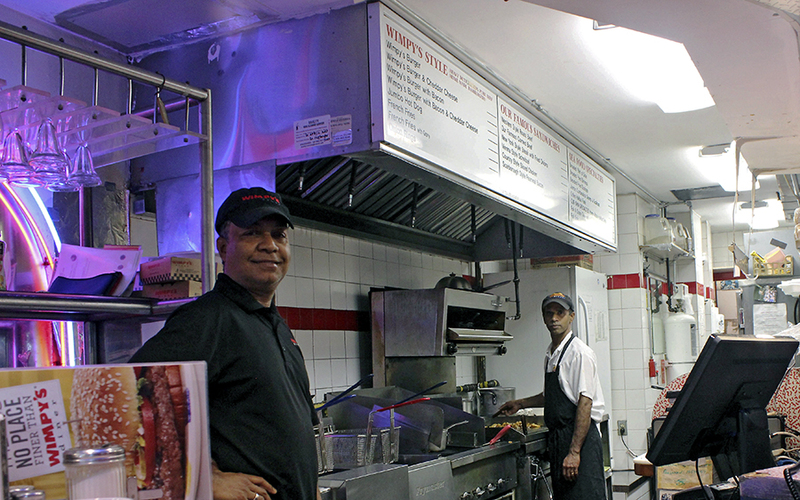 Wimpy’s, a provincial franchise, has been open in Birch Cliff since 1992 and employs 13 people. He said the drop in business has been dramatic — and is uncharacteristic of his customers, many of them regulars who live a few blocks away. He said it is worse than during the reconstruction of Kingston Road in 2013 and 2014. But Chowdhury is hopeful that, just like Wimpy’s made it through the construction, once the word gets out that they are still open, business will pick up. He has a year left in the space, and wants to make it count. “I’m going to miss all of it,” he said, adding that he is looking for a new space to rent in the neighbourhood. In the meantime, Chowdbury said Wimpy’s is open for business — the patio soon, too. I wish there were not multi-story residential building going up there but I suppose there is no stopping it at this point. The question is, why does it have to be either-or? Can’t a multistory residential co-exist with Wimpy’s at street level? Apparently not in Toronto. Let’s get those patio tables out!